Cinos and Derby County Football Club have teamed up to offer 10 Rams fans the full match day experience in the Cinos Suite. All funds raised from this initiative will go straight to the Club’s charity partner for the 2014/15 season – Macmillan Cancer Support. DCFC fans are being provided with the opportunity to bid for an exclusive Match Day Sponsorship package for 10 in the Cinos Suite when the Rams take on Brighton & Hove Albion on Saturday 6th December 2014 (kick off 3pm). 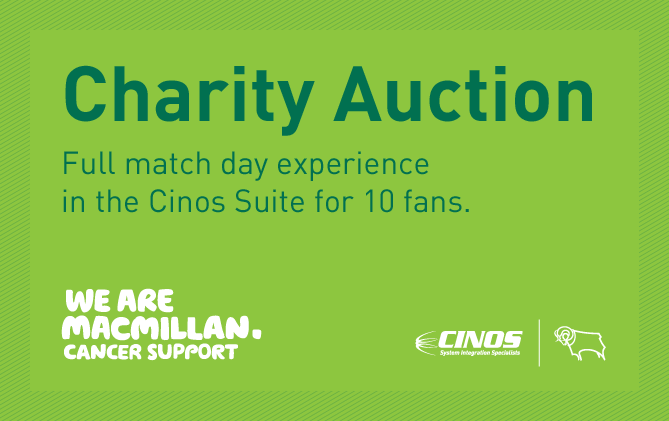 Cinos are delighted to donate this package to DCFC and its Charity Partner Macmillan Cancer Support. The auction will close on 30th November; a week before the encounter with Brighton. For more information and for the chance to bid on the perfect match day experience at the iPro Stadium please click here.